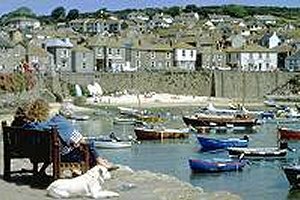 The village of Mousehole (pronounced Mowzel) lies on the western edge of Mount's Bay, approximately two miles south of Newlyn. This small village was considered to be of significantly more maritime importance than either Penzance or Newlyn in the 13th and 14th centuries. Its first fair Charter was granted in 1292 some forty years earlier than that granted to Penzance. Most of the original village was destroyed by a Spanish raiding party in 1595. A unique surviving building is the Elizabethan Keigwin Arms in the centre of the town. The traditions of Mousehole are maintained by the popular Mousehole Male Voice Choir and by a number of customs and festivals.